The Kestrel 5200 provides the same trusted accuracy, reliability, and usability as the original Kestrel 4200 and 4300. With its complete suite of environmental measurements plus special features designed to aid HVAC technicians, construction and agriculture professionals, the Kestrel 5200 outperforms the competition as the most compact and complete environmental meter and data logger for all professional uses. The new Kestrel 5 Series platform adds many new features and options. If you’re familiar with the Kestrel 4200 or 4300, the first thing you’ll notice is the larger, higher-resolution and contrast display and improved font readability. The Kestrel 5 series also includes a built-in dual color backlight, extra-strong polycarbonate lens and AA battery operation and offers optional LiNK iOS and Android wireless connectivity and app support. Like all Kestrel meters, the Kestrel 5200 is drop-proof, dust-proof, waterproof and able to withstand harsh environments without damage – so it can work as hard as you do, wherever you go. 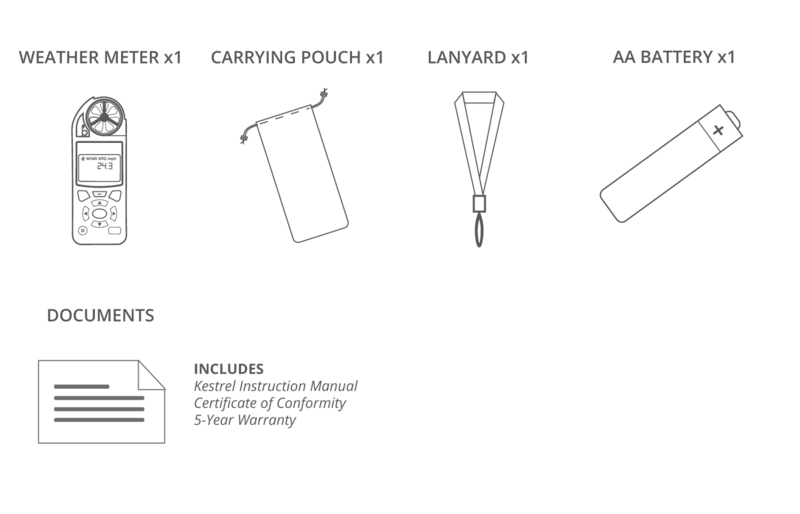 A range of carry pouch options makes it even easier to take your Kestrel meter with you. The Kestrel 5200 offers advanced calculators and readings that are unique in the portable meter market and are designed to make your job easier. In addition to measuring current environmental conditions, the Kestrel 5200 tracks and logs over 10,000 sets of time-stamped data. Your data log can be transferred to a mobile device wirelessly with the LiNK wireless communication option and Kestrel LiNK app, or to a PC/MAC with either the accessory Kestrel LiNK Dongle or waterproof(available separately). Kestrels have been put to the test in some of the harshest conditions on the planet. U.S. Special Forces, combat weather teams, wildland firefighters, smoke jumpers, Mt. Everest expeditions and auto pit crews are just a few who rely on a Kestrel to provide them with the crucial environmental data they need. Watch the Weather Channel during a hurricane, and you’re sure to spot a Kestrel in action. Technicians have been purchasing Kestrel meters for their toolboxes for years, knowing they will provide the readings they need immediately and reliably. Construction managers all over the world have relied on their Kestrel meters to ensure work-site safety and cost-effective concrete pours. Farmers that need know a Kestrel meter can help them avoid property damage and maximize productivity. Simple communication to Windows and Mac computers is provided through the optional LiNK .USB Dongle or USB Data Transfer Cable. Download your data to view, analyze and archive.Enables firmware update of Kestrel 5 series meters. When in range, view real-time measurements, receive on-screen alerts and download your data.Logged data can be viewed, analyzed, archived and shared via e-mail, Facebook and Twitter.Enables firmware update of Kestrel 5 series meters.